As the school year started several years ago, I realized that my students had no idea how the rest of the world lived. 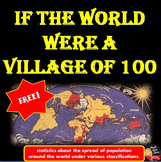 I read the book “If the World were a Village of 100 people” to give them a new perspective. We did several in class activities to reinforce the concept. Use my two-day lesson pack to teach concepts following a read-aloud of the text, "If The World Were A Village". This includes a two-day lesson plan layout and two worksheets, one of which can be used to create a class book if you choose to. Thanks for shopping! Using the book "If the World Were a Village" by David J. Smith students model decimals on hundredths grids. Product includes a short text and smartboard presentation about world demographics (food, languages, school, etc.). Perfect resource for RtI/Intervention, small group instruction, centers and/or learning stations. Incorporating literature into the mathematics classroom at any level can increase student engagement, as well as support ELL/ESL students. Book not included. Reading comprehension for every page of the book (Religion not included) and fun activities to explore other countries and their traditions when you're finished reading. Also included in: The Modern World BUNDLE (World History) Common-Core Aligned! Math resources to be used along with the book "If the World Were a Village" by David J. Smith. Students will model, add, subtract, multiply, and divide decimals. 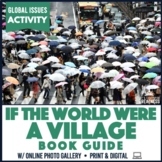 Math and Writing Activities to Accompany "If the World Were a Village"